This is a creative comp I designed for my Interactive Media & Advertising course in Spring '09. 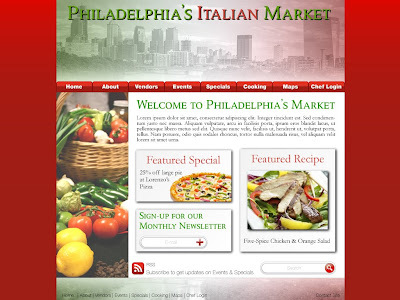 This comp is a redesign of the original Italian Market homepage. This was part of a semester long group project, which was broken into 3 separate phases. The proposal, the discover/explore phase, and finally the explore/create phase. For the project, we were to show our ability to effectively manage and harness the power of the team to arrive at breakthrough interactive solutions for our client. Since so much of the web is filled with half-baked media plans and haphazardly organized content, this project stressed the role strategy and positioning plays in determining how our audience will engage our brand in online or interactive media. As a part of the explore/create phase, this was one of our creative executions for the new look and feel for the Italian Market, which is a fresh and fun approach. We were also required to include a specific tactic recommendation to promote our brand. 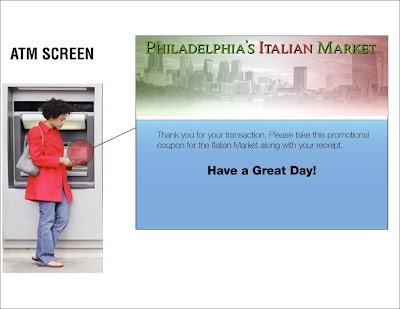 For our interactive promotion, we decided to place ATM screens throughout the Philadelphia area, as this would be a common touch point for all of our target audiences, which were tagged as 1) Out of Town Adventurers, 2) Thrifty Locals, 3) South Philly Natives, and 4) Gourmet Chefs. We also thought that this would be a great way to get a direct response from users and track our measures of success because we can see whether or not they're using our coupons.